There are multiple reports about this in the forums (see below). Basically, when in Live View mode, if the ML Menu is accessed (via the trash button), it times out and goes back to the Canon Live View screen after typically 5-10 seconds. The amount of time it takes to go back varies. Nanomad on the forums says that "The underlying Canon dialog times out." I think this is right -- I have noticed that when the ML Menu disappears, for a very brief period (maybe 1/10 of a second) a Canon-looking dialog appears but then the regular Live View mode is shown immediately thereafter. Oh, I forgot to mention that I have not seen this problem when in non-live-view mode. So the workaround is to switch the camera to viewfinder mode, enter the ML Menu, make your changes, exit the ML menu, and switch back to ML mode. Not very convenient, but better than nothing. For 2, no low-level research is required, just somebody willing to check how these dialogs react to fake events. Extra care must be taken to make sure the fake buttons don't do any action in the menu (either find a button code that does nothing in menu, or block the fake event in handle_ml_menu_keys). Just confirming I see this same issue. I have to switch away from LiveView (including movie mode) to make any changes to movie capture ML settings. Since all the movie capture settings appear dim/disabled when not in movie mode, it can be hard to see the settings in bright environments. 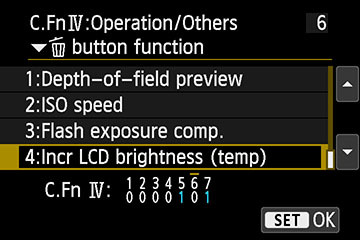 In case this is related to EOS M menu disappearing after a few seconds as well, I tried number 2 of a1ex's suggestions. I tried a few button codes (EOS M doesn't have that many buttons to begin with) and with all of them the menu still disappeared like before. Even when I used button left for example, which made the ML menu move between tabs, the menu still closed. If I browse the menus normally with physical buttons it doesn't close so there seems to be something different between those and faking them. If faking the left button causes ML menu to move between tabs, the event does not reach Canon GUI code. Can you comment out the "case BGMT_PRESS_LEFT" from handle_ml_menu_keys (menu.c) and try the same test? To make sure the event reaches Canon code (and is not trapped by some ML feature), you can print it in gui.c, at the very end, right before calling f(event); that "f" is Canon's event handler. Tried both BGMT_PRESS_LEFT and BGMT_UNPRESS_LEFT and unfortunately neither help. The event goes to Canon code and moves the AF square over ML menu, but the menu still disappears as before. If you can get a log file that shows when Canon code decides to turn off the dialog, would be great. To use the debugging code in LiveView, you may want to use FPS override (because LiveView generates lots of debug activity). I put this small snippet to run_test() and set FPS override to 1 fps so that it started the log when I was back in ML menu and stopped a short while after Canon code closed it. Anything I should be looking for in the log? I tried killing dialog timers, blink timer/olc timer and a bunch of others just like the date timer trick. None of them would prevent the menu from disappearing. I found a value that changes when the dialog goes away and altering it only left the dialog up frozen with no scroll wheels. Its like there is an MPU timeout or something. Issue #2048 was marked as a duplicate of this issue. @Jarno Paananen: do you still have a copy of the log? The link is no longer working, and I can't find my local copy. Should be working now again, restored it from Dropbox. Thanks; I asked because @nikfreak also wanted to look at it on 6D. The messages are from Canon code, so... you'll get the same logs. But it's worth trying on 6D (Jarno's was on EOS-M). have any effect on this? Dunno if it's used somewhere in code and could be relevant for this bug. If so then I think above listed stub is wrong. I assume it is either 0xFF4B59D8 or FF4B5A3C-RAM_OFFSET or FF4B5A98. Can anyone check??? This one is used for asking Canon graphics to redraw. If it's incorrect, it should be really obvious (try commenting it out in zebra.c). There is a stress test for it in the Debug menu (Redraw test). I will try and repaort, thx. @Alex what should happen if I do "redraw-test"? I did now on my 6D. I got thrown out of ML menu immediately. SD LED blinked some times, too. That's it. It should keep redrawing; you can see ML overlays fighting with Canon's, for example. I did check the stubs from 5D ROM before commenting here yesterday. Did it the same way I found the other handful stubs for 6D with comparing 5D ROM in ARMu. I did some other test yesterday and used my guessed stubs posted above to compile autoexec.bin for 6D. I couldn't see any changing effect of this stub on my 6D whichever of the above stubs I use. So to sum it up: Whatever value I use for this stub nothing changes compared to nightlies. Gave up on this to play around with 32MB card benchmark buffer afterwards. Here's an easy way to see it: run both the rectangle test and the redraw test in parallel at the same time. Start the rectangle test first, to see the difference. When you run both, the rectangles will be erased quickly by the redraws. If you don't run the rectangle test, make sure you have some ML overlays on. After the LED blinks, these should flicker like crazy. In boot-hack.c all those if-clauses for 6D are confusing. Hijacking 6D gui-task? Is there no possibility to remove that? Another idea may be to re-initiate the 6d gui_task when switching between photo and LV mode to get the bug fixed. I'd also like to fix the task override on 6D, but Canon changed their internal task structure. They also did that on 100D, and probably on 70D. Luckily, QEMU can emulate the DryOS task scheduler, so it's the tool to use in order to fix this. Not an easy job though. And the last idea is to trace the MPU events from SIO3_ISR, figure out how they are translated into GUI events (it probably starts in SwitchFromPartner, not 100% sure), and see what else is called in this process (it must reset some timer somewhere, I guess). Will post some findings about MPU communication soon. "Nanomad on the forums says that "The underlying Canon dialog times out." I think this is right -- I have noticed that when the ML Menu disappears, for a very brief period (maybe 1/10 of a second) a Canon-looking dialog appears but then the regular Live View mode is shown immediately thereafter." I narrowed it down. It's the "Image Quality" Canon menu (where you select RAW / MRAW... / JPEG L / M / S1...) which is visible for some milliseconds. No matter which canon menu I use before. It's always that image quality menu which is underlying. Additionally and that's a lil bit strange: normally this canon menu has red marker boxes but the underlying one seems to have orange color. maybe this description is useful to fix the problem. Anyone an idea? I guess all transparent LV dialogs have the same timeout value, right? The mystery is where this timer gets set up - if we knew the timer address, we could simply cancel it. Yes, each have the same timeout value. It's about 3-5 sec. Will have to play around with dmspy and add some code to "don't click me". maybe that can help to identify what's happening. Good point. Logging timer functions may help (it's most likely a plain timer, not a high-res one, so logging SetTimerAfter might be useful). Alright - can you catch such a log when such a LiveView dialog opens, and leave it until it times out? Can't be - this barely covers 2 LiveView frames. I expect the GUI mode to be changed. The full log about 4.33MB is here: http://www.file-upload.net/download-9704590/dm.log.html Hope that helps to find a solution. wow! scratch it! I found the bug. Will submit a pull request to unified. better to pull the cancel timers from that log and see what each of those functions are. as 70D suffers from same problem in movie and LV I now found out that it won't happen while recording. Doesn't matter if raw_rec used or not. The bug won*t happen. Interestingly the menu background will be transparent (kind of very light grey, you can see trough it) while recording (not black). Can't remember if it was transparent when I used to have a 6D. Also took a screenshot from menu but that ppm will have the screen black and not transparent although it appears transparent on LCD. Now tried to catch a log while recording and pressing trash button like crazy (about 20 times to bring the menu on and off. Once recording is stopped the bug appears again. menu background is black again. Reproducable whenever I want - also after cold boot. Issue #2156 was marked as a duplicate of this issue. @nikfreak what did you mean when you wrote that you found the bug ? do you have the pull request you were talking about ? I'm trying to gather more info about this and every bit helps. that was simply thought wrong in past. I didn't even manage to find a fix. I'm new to bitbucket (but I've been using ML for 2+ years), I have this same issue on my 6D 1.1.3. Is there a way to upvote bugs or just add my voice to the crowd? I tried disabling all the timers I could think of in the canon menus, image review, power off, etc. Didn't change anything. You can vote for the bug, but it won't help fixing it. It's just really hard to fix and requires a lot of time and a good understanding of the inner workings of the Canon firmware. There could be workarounds I'm looking into, but I cannot promise anything. what about PROP_LV_ACTION and that "[MC] CancelTimer...." in 6D.113 ROM at around FF1514138??? PROP_LV_ACTION is used to turn LiveView on or off (see PauseLiveView/ResumeLiveView). I believe we should cancel some timer, but I have no idea how to find it. I have some hopes with QEMU though. Issue #2306 was marked as a duplicate of this issue. Issue #2316 was marked as a duplicate of this issue. Issue #2387 was marked as a duplicate of this issue. I've been doing some testing on a 700D and noticed that it isn't an issue with this camera. I've also been testing the 100D and it does have this issue. Please edit the description, removing 700D and adding 100D. FYI, I have an EOS M now. So what's wrong with just restarting the Canon dialog? There's actually already code to do this that is commented out (with a macro, not comments). That current code causes the screen to blink, but if you take out the bmp_off() and start_redraw_flood(), then it works just fine. Every once and a while the red scroll wheel icon blinks (I assume this is during the time between when the Canon dialog times out and the new one gets started), but the M's scroll wheel is sort of useless anyway, so I wouldn't mind not using it at all in the menu (so maybe we could eliminate the need for the Canon dialog altogether?). Anyway, I couldn't manage to change Canon settings "accidentally" with the scroll wheel by constantly turning the wheel during this time between when the dialog times out and when a new one is started - that doesn't mean it's not possible if you are more lucky than me, or try longer. You mean in src/menu.c at line 4045? Theoretically, I guess, wheel events could "get through" to Canon firmware and change shooting settings (see the red wheel warning pop up?). I couldn't manage to do it though when I tried. There might be other reasons I'm not aware of which is why I'm asking. @David Milligan Should I make a PR? @Alex Any feedback on this? And, indeed, if the scroll wheel is not useful, you could try defining GUIMODE_ML_MENU as 0 in consts.h, so it won't use a dialog. This one will probably apply only to EOS M.
So this needs some #ifdefs in front maybe to limit it to the affected cameras? ./platform/700D.114/consts.h:157: #define GUIMODE_ML_MENU (RECORDING ? 0 : lv ? 90 : 2) // any from 88...98 ?! ./platform/70D.111A&B/consts.h:206: #define GUIMODE_ML_MENU (RECORDING ? 0 : lv ? 92 : 2) // any from 88...98 ?! ./platform/EOSM.202/consts.h:105: //~ #define GUIMODE_ML_MENU (recording ? 0 : lv ? 90 : 2) // any from 90...102 ?! ./platform/EOSM.202/consts.h:107:#define GUIMODE_ML_MENU ( RECORDING_H264 ? 99 : 90 ) // any from 90...102 ?! 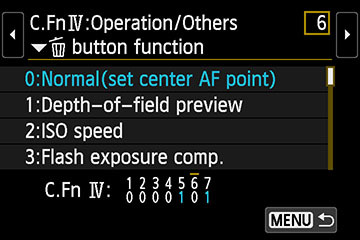 /LE: on EOS-M setting it at 0 breaks ML menu operations, arrows (pressing up/down/right/left) no longer work. Issue #2480 was marked as a duplicate of this issue. Yeah! Downloading now. Thanks guys! Issue #2507 was marked as a duplicate of this issue. It's a workaround, not a proper fix. The menu still timeouts, flickers, and during that short period, there is a risk of changing some Canon setting by mistake (depending on what dialog is behind ML menu). Issue #2454 was marked as a duplicate of this issue. Issue #2540 was marked as a duplicate of this issue. Thanks for the awesome tools. I have a Canon 6D, and have the same issue (when in live-view and viewing the ML menu). At first I thought perhaps it was just me, but then I stumbled upon this. Anyways, just letting y'all know. Keep up the good work. Would love to contribute, just need the time! Issue #2577 was marked as a duplicate of this issue. I have a Canon 6D as well and I am encountering the issue when using in live-view using the ML menu. Is there any work around? Issue #2754 was marked as a duplicate of this issue. Issue #2688 was marked as a duplicate of this issue. Just noticed some parts of EOS M's LiveView are working in QEMU (after pressing I(NFO) a few times). For example, pressing the up arrow brings the drive mode dialog (single, continuous, self-timer and so on). However, this dialog doesn't time out. Is this true on the physical camera, or it's just an emulation bug? If it's the latter, the timeout decision might be taken on the MPU. A long press on the down arrow makes the screen white for a moment. This one is supposed to open ML menu, but for some reason it doesn't work in the emulation. A short press on the down arrow (after latest commit) does nothing. What's this key supposed to do on a vanilla EOS M (without ML)? Pressing LEFT or RIGHT will move the focus box horizontally. A startup log (dm-spy-experiments branch) with mpu_send/mpu_recv stubs, catching both opening and auto-closing ML menu, would be very helpful. Caveat: LiveView creates a lot of logs, so you may either try to allocate a few MB for the log, or silence some messages. The Trash button has several functions depending on what mode the screen is in. The default is to center the AF box. The manual doesn't call it the Trash button so it is hard to search for the various functions but the Custom Functions(CFn) menu shows some of the tricks it can do. I'm having problems creating a startup log. Compiling dm-spy-experiments branch with CONFIG_DEBUG_INTERCEPT_STARTUP=y and the camera just hangs. Lots of LED action for a few minutes then the light goes solid. LiveView never comes up. Needs a battery pull to recover. Centering works; how do you move it up and down? Troubleshooting: disable the common stubs (CONFIG_DIGIC_V in dm-spy-extra.c) or the entire extra stuff (comment out dm_spy_extra_install / uninstall), or use less memory. The log doesn't have to cover the startup process - in this case you may find easier to allocate a few MB of memory. You move it up and down with your finger--on the touch screen. That build you pointed out has the same issue. Maybe I'm not waiting long enough? I let it run for several minutes. I'll try following your instructions to see if I can get it working. Uh--where do I allocate a few MB of memory? You mean here? Memory amount is tuned from there, but only with CONFIG_DEBUG_INTERCEPT (without STARTUP) it will use our memory backend (so it should be able to allocate some 10-20 MB without much fuss). The one with STARTUP allocates from AllocateMemory (hardcoded), though it can be changed (but requires some fiddling). Here is an EOSM startup log file using the build posted on Sept. 11. Turns out that after letting it run for several minutes it did save a log. If it doesn't work I can try some of your suggestions--I've already tried a couple but no luck. Yes, I know I've done this before without issues. That's too verbose; try disabling LOG_INTERRUPTS and everything under CONFIG_DIGIC_V in dm-spy-extra.c. That will still miss a complete menu cycle, so you'll still have to either allocate a couple of MB for the log, or reduce verbosity even more. An easy way would be to accept only the DebugMsg calls coming from ML (class == 0 && level == 0). Not sure if this is working. The changes I made produced these two log files. The good news is that the EOSM isn't hanging on startup and it displays the message when the log has been written. You've got valid logs, so it must be working. The troubleshooting section was there because you said you have trouble getting any logs (and battery pull was needed). Now undo these things (maybe one by one) and try to get some log covering both ML menu opening (in LV) and closing (because of timeout). I don't know in advance what messages are relevant for this; I've assumed MPU ones might be; maybe also some of the many GUI messages, or CancelTimer, but there are many of those (so the buffer gets filled pretty quickly). If the log gets trimmed (easy to tell from file size), you need either more memory, or less verbosity. To know how much memory you have available for startup logging, look in Debug -> Free memory -> AllocateMemory. Leave a few hundreds of KB for the system and use the rest for logging. To get even more memory, see previous advice. Ok--I know that this isn't there yet but making some progress. What was causing the EOSM to hang was the calls to dm_spy_extra_install. It still worked with dm_spy_extra_uninstall but the Debug menu was showing an "unpatch" error. Regressed everything except those calls. I also fiddled with the memory allocation. I'm probably close to the limit because the LV is showing a pink cast but got much larger startup logs. It looks like you're looking for what is going on with the ML menu timing out. I remember that was "fixed" a while back with a routine that would refresh the screen before it times out but this resulted in the LV appearing in the focus area through the ML menu for a brief moment when it kicks in. On the dm-spy-experiments build all that happens is that a small red icon flashes on the bottom right of the screen. So isn't it necessary to create a log that shows the ML menus opening and timing out? That wouldn't be in a startup log would it? Here is a log (not a startup) where the only action was to bring up the ML menu by using the down (trash) button then waiting until that red icon appeared in the lower right corner of the screen. Yeah, a lot of "Evf" noise in there but maybe what you're looking for is in there? The last log covers about 2.7 seconds and does not cover the menu opening. If the log is not a startup one, you could even try 32 MB (but you still won't catch the menu timing out). The pink flash is likely a sign of CPU usage (logging all this stuff requires lots of CPU time). FPS override usually helps; there's even a very simple version in fps_log. If it's not too bad, you could leave it like that and just silence the Evf messages (about 60% of the lines). The ones from Epp and AeWb are also worth silencing (about 15% of the lines). These are easily identified by something like: if (streq(current_task->name, "Evf")). To catch the menu timing out, the easiest way is to log only mpu_send/recv and silence out everything else, but that way you'll also throw away useful info. Still, pure MPU logs (without any context) are better than nothing. I'll try to catch the menu timing out later. Got called into work. EDIT - Ok, I'm a little lost. How do I skip the Evf, Epp and AeWb lines? New log, dm_spy_extra_install/dm_spy_extra_uninstall restored, most stubs commented out, only action was Trash button to bring up ML menu. Interesting this works with CONFIG_DEBUG_INTERCEPT but hangs and needs a battery pull with CONFIG_DEBUG_INTERCEPT_STARTUP. Another startup log. This time commenting out the patch hook function in dm_spy_extra_install. This is what was causing the camera to hang with CONFIG_DEBUG_INTERCEPT_STARTUP. So there must be something that check_no_conflicts isn't catching. It also might explain why it why it works with QEMU but not in camera. More likely, one of the patched functions is misbehaving somehow. You could try doing nothing in that function (it's generic_log, unless specified otherwise in the stub definition). None of the latest logs have MPU messages. The Evf test goes in my_DebugMsg (by default, engio messages are suppressed). Updated dm-spy-experiments to record about 20 seconds of LiveView in 2 MB, and also enabled MPU messages everywhere (tested on 5D3). Logs are also welcome from 6D owners. Instructions were printed on the box, yay. Something like these, or more specific? New logs using the latest dm-spy-experiments without any modifications. EOSM still hangs with the startup log but this time I noticed that it logged my shutdown attempts so maybe this is useful. The other log is an attempt to log the Trash (down button) only and this time there are MPU messages. Still to do is to try and log the ML Menu time out but that will be tricky. Is there any way to know if it has been successfully logged? I take it that we need to take out those Evf, Epp and AeWb lines. Finally got a log without the Evf, Epp and AeWb lines. Tried a few times and think maybe this log captures the ML Menu time out issue. Turned on logging, opened ML menu and waited until the red icon appeared in the lower right corner of LV screen then immediately stopped logging. Yes, the last log captures the menu timeout. SetGUIRequestMode(90) is when entering ML menu. SetGUIRequestMode(42) - maybe that's the menu times out? It's quickly followed by SetGUIRequestMode(90) from ML menu task. SetGUIRequestMode(0) - probably shutdown; it's preceded by some sensor cleaning stuff. However, the log is missing MPU messages. These are important. Is any of them causing crashes? Managed to get ML menu, but I need to fake the display state (the LiveView emulation doesn't go as far as turning on the display). The menu doesn't time out in the emulation. Still, enabling the MPU messages in the logs could give some clues. If you press UP in LiveView, do you get the drive mode dialog? 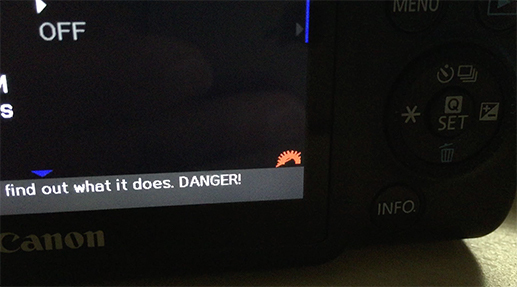 Does this dialog time out on a real EOS M? If so, can you also catch this timeout in the logs? Hopefully this one is a little more useful to the current discussion. Started in movie mode, jumped to ML menu and let it timeout. That one only covers the start of menu, not the timeout (the log was trimmed). This branch has the new DryOS hooks, so it should accept 2 MB for the logging buffer. Hmmm, I was using the build you provided above, and notice all LOGS are only 512K. @Audionut Those test builds I posted are already outdate so I removed them. Looks like the 6D testers that are left can compile so I won't post updated builds for now. Timeout on this screen seems to be by design. I removed ML and the timeout still happens. Tried to capture it in this log. Then ran a startup log on the EOSM. Pressed the down (Trash) button while the log was being written. Hope this shows some of what you need. To confirm, I was using a build from here. That's strange. You posted a 700D startup log with MPU messages on the MPU communication topic. I just created a startup log on that camera and don't see those messages. So are the MPU events only logged in QEMU on the 700D/EOSM/6D and possibly other cameras? They are present in your "vanilla" logs, and also in Audionut's logs. They are also present in your older logs (from January iirc) from 700D and EOSM. Couldn't see the forest through the trees so I re-read all the posts on this issue and think I get it now. So the menu timeout isn't visible because it was "fixed" a while back but that wasn't a proper fix--something like a fake shutter half-press event on a timer to keep the ML menu open. On the EOSM that event shows a small red wheel icon in the lower right of the screen. MPU events are showing up in dm-spy-experiments but when I tried trimming down the log outputs for the EOSM it no longer shows the necessary MPU events. On the 700D I ran a new startup log, this time opening up the ML menu during startup and hopefully caught the timeout issue. On the EOSM there is a problem running the patch_hook_function (camera hangs) which might be needed to log the MPU events? Maybe check_no_conflicts isn't catching a conflict on the EOSM? The 700D log didn't catch the timeout issue, but it shows the action of opening ML menu (and also has MPU messages). Hold a second - the 700D doesn't even have menu timeout! "Merging new-dryos-task-hooks allows for larger log files" - this only applies to 6D, as there's a small bug in unified (it reserves way too much for autoexec.bin). On EOS M, if you comment out the contents of mpu_send_log and mpu_recv_log, but keep the patch_hook_function, does it still crash? If yes, it's from the patch backend; if not, it's from whatever the two logging functions do. Can you comment out only one of them to see which one crashes? Now we're getting somewhere. On the EOSM with both mpu_send/mpu_recv commented out it works fine but of course no mpu events. Only mpu_recv commented out it also works fine and saves mpu events. Only mpu_send commented out camera hangs and it does create a crash log. Built on 2017-10-29 17:45:14 UTC by rosiefort@RosieFoComputer. Got it - try undefining MPU_DELAY_SEND. Back online. Looks like that was the key. Opened the ML menu while logging startup. Hopefully it caught the timeout event. So should there be an exception for EOSM on defining MPU_DELAY_SEND? At least for a startup log. Also with the undefine MPU_DELAY_SEND "fix" -- started logging, entered ML menu, waited for menu timeout then immediately stopped logging. Looks like undefining MPU_DELAY_SEND is necessary on the EOSM in order to log MPU events. This one doesn't capture the menu timeout (only the first SetGUIRequestMode is present). Try getting this log, with MPU messages. Started logging, opened ML menu, waited for red icon to appear, stopped logging. Not sure what to look for in the log but here it is. This log was trimmed at 512K. Ok--this is strange. I forgot to undefine MPU_DELAY_SEND before that last test yet the MPU messages are there. What was different on this test was that it took several seconds before the red icon I was looking for appeared. So maybe it takes a while before it starts logging MPU events? That's the job of MPU_DELAY_SEND? In any case that last EOSM test run was done on an unmodified dm-spy-experiments build with CONFIG_DEBUG_INTERCEPT=y in Makefile.user. One more time before heading to work. Though it looks like that wasn't necessary for this log. That's only needed for the EOSM when creating a startup log, right? More specifically an in camera startup log. Now if the EOSM can handle 2MB log files I suppose that applies to other cameras that can use the new dryos task hooks. Speaking of new-dryos-task-hooks, what's with all the foo'ing files that "make clean" doesn't remove? Ok--I'm going off topic, just looking at ways to make things easier on the next guy that uses dm-spy-experiments. Issue #2847 was marked as a duplicate of this issue. Reproduced on 5D3 after changing GUIMODE_ML_MENU to 41 by mistake. 84 does this too. => worth trying some other GUI modes for the affected cameras? On the above GUI modes, I believe it's the MPU that decides to turn off the Canon dialog that sits behind ML menu. Ran the test code on the EOSM. LED blinks every couple of seconds and the ML overlays are gone. Can't get into the ML menu. If the ML menu is brought up before the overlays disappear then the LED blinks as before and the menu doesn't time out. 5D3 also pops the audio meters on the silent-control branch. Yes, exactly the same issue.